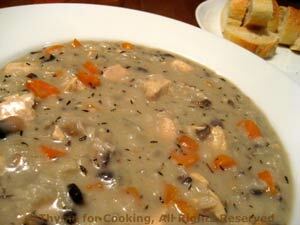 Chicken Mushroom Chowder, Thyme for Cooking easy, seasonal gourmet soups. If one can put an egg on pizza, why not add one to soup? A poached egg nestled in the center of the chowder adds interest, flavor and a bit more protein to stretch the leftovers. Plus, it's delicious! 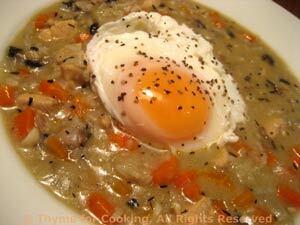 While soup heats poach egg: Fill a large skillet with water. The water should be at least 1 1/2 inches deep, 2 inches (5 cm) would be better. Heat water over medium-high heat. Add vinegar. When water is softly boiling poach eggs: one at a time break egg into a small saucer. Swirl a spoon in the water where you will put the egg - off to one side. When water is swirling drop egg into center. With slotted spoon try to keep the white together. Poach for 3 - 4 minutes or until white is set but yolk is still very soft. When eggs are almost done ladle soup into bowls. Remove eggs with a slotted spoon, drain briefly and gently add to soup. Serve.